Tekels Park is one of the extant remnants of a manor, the origins of which date back to the middle ages. One of the other remnants is the separately owned Frimley Manor, three quarters of a mile south of Tekels Park and separated from it by the M3. In 1806 ownership passed to John Tekell (sic) who was responsible for the building of the first Tekells Castle, later destroyed by fire. A full history of both estates is available in a booklet published by the Surrey Gardens Trust ('Frimley Park and Tekells Park Estates' by Kathleen M. Burgess) from which these extracts are gratefully taken. Today the entrance to the 50 acres of Tekells Park is from the north along Tekels Avenue, a private road turning off Park Road, Camberley. After passing through the gateway to the estate the drive continues between the kitchen garden on the right and on the left the houses built by members of the Theosophical Society, owners of the estate from 1929 until 2014. These houses are set back from the drive and screened by tall hedges. The drive continues until a dead end is reached where the M3 Motorway cuts across the southern end of the estate. The lower part of this drive formed part of the old main access to the estate from the entrance by the lodge on the Portsmouth Road and it is still a tree lined avenue. The entrance lodge can still be seen near the 'One Oak' public house. As the lodge was cut off from the estate by the construction of the M3 Motorway it was sold. It has been much enlarged by the extensions built on at the rear, but the front remains unchanged. A turning off the drive beside the kitchen garden leads to a small car-parking area. The walls of the kitchen garden have been much repaired, but three corner towers with crenulated walls remain. These give an idea of the structure of Tekells Castle, which was also built with crenulated walls and bore some resemblance to a castle. Though nothing has survived of Tekells Castle there remain three grass terraces on descending levels to the south of its site. These terraces are separated from each other by hedges with central openings providing access from the higher to the lower levels. On the lowest level is a circular pool with a modern central fountain (see illustration - left). Nearby are lawns surrounded by beds of ornamental trees and flowering shrubs. There are good specimens of a Wellingtonia and a Monkey Puzzle Tree. To the south of the terraces beyond a belt of trees is a meadow of about 20 acres. This is important as a site of unimproved acid grassland which is comparatively rare outside Sites of Special Scientific Interest and has been designated a 'Site of Nature Conservation Importance'. It has been the object of a joint visit by the 'World Wildlife Trust', Surrey Heath Borough Council and Surrey County Council. The site was surveyed in April 1995 and the species of plants growing there were identified and recorded. The north of the meadow is grassland with fine grasses and varied herb species while to the south the meadow is a mixture of grassland and heath land. The site has not been intensively managed and this has benefited the conservation interest. It is thought that one part of this meadow was used as a cricket pitch at one time and that it was ploughed for the growing of potatoes during the Second World War. The estate is bordered by dense woodland along its boundary with the M3. This consists of young woodland, which has regrown since a fire of some 20 years ago. Oak and birch are the most common species. There are further belts of woodland to the west of the site. Here the woodland is dominated by Scots pine with some oak, holly and rowan. There are also conifers here. More woodland shields the estate on its northern boundary, while to the east are the houses built originally by Theosophical Society members but now mostly privately owned. 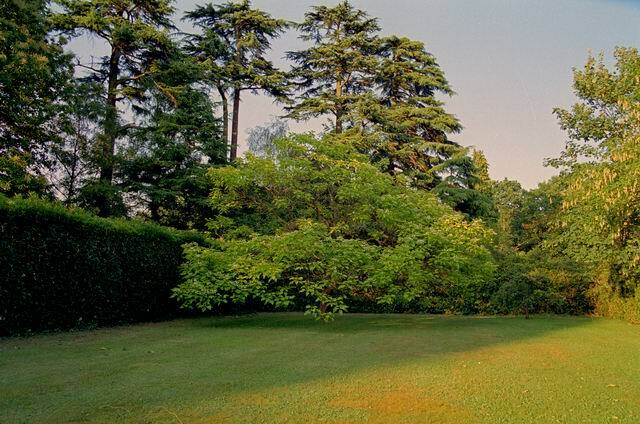 After the purchase of Frimley Park Estate by Captain Knight and Major Spring in 1860, Captain Knight was responsible for laying out the original grounds. There is a description of these gardens in Miss Daisy Hills' book, 'Old Frimley', published in 1978. Her grandparents, George Hills and his wife, both worked for Captain Knight. In the 1871 census, George Hills is described as an 'Estate Steward' and his wife as a 'Housekeeper'. The Hills family lived on the estate in 'Oak Cottage' now the 'One Oak' public house near the entrance lodge on the Portsmouth Road. Miss Hills records the memories of her grandparents who described Tekells Park as they knew it. 'Tekells Castle was a lovely place and the grounds were beautifully laid out. Peacocks spread their magnificent 'fine feathers' on the terraces and the air was full of bird song and the scent of flowers. All the surrounding rough ground reaching down to what is now Brackendale Road seemed to enhance the beauty of the Park and gardens nearer the house and it must have been a delightful place'. These memories do suggest that there were terraces at the house from Captain Knight's time. This is borne out by the description of the grounds contained in the 1868 Sales Catalogue when Captain Knight put the 333 acre estate on the market. The Gardens and Pleasure Grounds are laid out with great taste, and dispersed in Grass Terraces, Lawns, and Walks; they are handsomely dressed with choice Shrubs, Ferns, and Flowering Plants, in great variety, and there is an excellent Walled Kitchen Garden ... The Park is well undulated ,,, and portions are in heather and gorse, adding greatly to its picturesque character'. A map which accompanied the 1868 sales catalogue shows the estate to be heavily wooded with conifers. It is known that these were planted by the younger James Lawrell. The area to the south of the house being much more open is probably where the heather and gorse were to be found. This is the acid meadow described in the report written in 1995. The map shows that the original entrance drive from the east, having crossed the stream, divided, its two branches passing to each side of the meadow. One branch continued to the east side of the stabling and the kitchen garden, while the other swung round to the north side of the house. Eventually these drives reunited. The drive to the east is still there today, but the other drive to the west has become a footpath through the woodland. This central area of the estate, near the house, comprises the 50 acres of Tekells Park today and the drives described are now close to the estate's boundary. The remainder of the 333 acres of the estate outside this central area is depicted as woodland intersected with further drives. In 1860 when Captain Knight and Major Spring bought Frimley Park Estate and divided it between them, they brought their wives to live in Frimley Park Mansion and both couples were there at the time of the 1861 census. Major Spring then built a "small house" later known as 'The Watchetts' for himself on his share of the estate. On his share of the land Captain Knight built a different Tekells Castle on virtually the same site as that used by Tekell and moved in with his family in 1863. Captain Knight and Major Spring were responsible for further divisions of the land. Captain Knight sold Frimley Park Mansion with 140 acres of land in 1862. This may have been for financial reasons or possibly because he preferred the site of Tekells Castle with its view of the surrounding countryside. Undoubtedly, he and Major Spring were business men and when making their plans they foresaw the demand for shops and houses to supply the needs of the new Staff College, just as the establishment of the Royal Military College had led to the development of York Town. As a direct result of this policy, Camberley with its shops and houses was built. Major Spring followed a similar plan and much of his land was sold for the further development of York Town. In 1870 Tekells Park Estate, reduced to 333 acres of land, was sold to General Byrne. He was a sportsman and owner of racehorses, which he stabled at Tekells Castle. His wife was a daughter of Don Pablo Larios y Herreros de Tajada, Marquis of Larios. She was said to be a relative of Empress Eugenie, widow of Napoleon ill, who lived at Famborough Hill. Certainly General Byrne and his wife frequently visited Empress Eugenie for afternoon tea. General Byrne continued the process of dividing the estate. By 1895 it had been split into four smaller estates - Brackendale. Pine Wood, Waverley and Tekells Park itself. General Byrne disposed of Brackendale, Pine Wood and Waverley and they were subsequently developed as residential areas on the outskirts of Camberley. In 1902, four years after the General's death, Tekells Park was sold to Mr. A. Wilson-Hughes. He added a new wing to the house in 1904, built in the same style with crenallated walls as the original. He also remodelled the interior of the house. In 1905 he tried to resell the property but no buyer could be found. The advertisement for the 1905 sale contained a sketch showing the crenellated walls which gave the house both its castle-like appearance and its name. The sketch also shows three terraces extending the length of the house, each terrace separated from the one below by a low hedge. On the lowest terrace, further from the house is a circular pool with a central fountain, very different from the one that can be seen today. This is the earliest pictorial confirmation found of the grass terraces, hedges and circular pool. Although the trees and shrubs were said to be the finest in the district, the advertisement emphasizes that the 'grounds require only two gardeners' suggesting that the grounds and garden received only minimal care during the three years of Mr Wilson-Hughes' ownership. The property was to be sold freehold with 7 acres but with the option of further woodland or parkland up to 120 acres. One night in October 1906 Tekells Castle was burnt to the ground. Fortunately the house was empty at the time. It is thought that Mr Wilson-Hughes may have left gas jets burning. The stables, coach-houses and coachman's house being a short distance away from the house were unaffected by the fire. The estate was unoccupied for the next twenty-three years. A group of members of the Theosophical Society were able to purchase the 85 acre estate for a modest sum in 1929. They formed themselves into 'Tekels (sic) Park Estate Ltd.' Members of the Theosophical Society had been looking for a reasonably priced estate in this country for some time and Tekells Park fulfilled their requirements. Over a period of 20 years they took up leaseholds of plots of land and some 20 houses were built along the eastern boundary of the estate. The community built what is now the guest house on the site of the stables and coach house and incorporated some of these older buildings into their own. Nearby they built the Lecture Hall, which was registered as a place of worship in 1931. 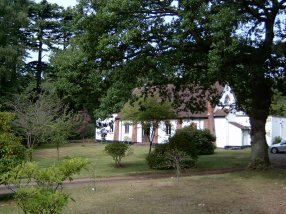 It was hoped that the estate would become a Theosophical centre, teaching the Theosophical philosophy, which includes respect and reverence for nature. So, it was important that the grounds should be rescued from their derelict state. With the limited resources at their disposal, members are preserving Tekells Park estate with its meadow and surrounding woodland. In 1961, only one of the original members responsible for the purchase of the estate was still alive and he was concerned about the future preservation of the park. He persuaded the Theosophical Society to buy the property for the nominal sum of £2,600. 'Tekels Park Estate Ltd.' was retained as a separate entity but now controlled and administered by the Society. Madeleine Leslie-Smith, a long-term resident of Tekels Park wrote 'A personal recollection' in 1996. She commented: 'Tekels Park is in reality a mini Nature reserve ... It is up to us to preserve it from encroachment so that it may increasingly become a centre of Peace and dynamic spirituality' (26). These descriptions convey an accurate picture of Tekels Park estate as it is in 2000. It is surrounded by residential development except on its southern boundary, which adjoins the M3 motorway. Its size was reduced from 85 acres to 50 acres in 1964 when a parcel of land was compulsorily purchased for the building of the new motorway. This prompted the Society to sell the strip of land that had been cut off from the rest by the motorway. The ensuing funds enabled the Society to extend the guesthouse and make other improvements.